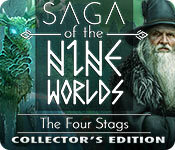 Saga of the Nine Worlds: The Four Stags Collector's Edition is rated 3.6 out of 5 by 27. Rated 5 out of 5 by Linndyloo from Excellent game! This was one of the rare games: one that I didn't want to end! I was so happy that I had the collectors edition. 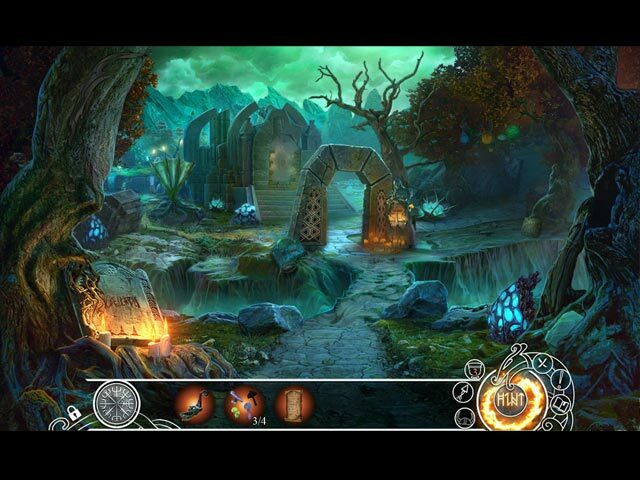 Everything from the graphics, the storyline, the animation and the puzzles blended together to make a cohesive experience. The puzzles were just challenging enough to give me pause every now and then, but I eventually made it through (though I did use more hints than in any other game I have played to date.) Highly recommend this game for something both unique and wonderful! Rated 5 out of 5 by GRHA from Best game for a long time. Really loved this game. Its got lots of challenging puzzles, good graphics and sound. Quite difficult at times but a long and challenging game. Worth every penny. Rated 5 out of 5 by nariiska from A beautiful quest I was excited to see this game as I had tried the demo. This is a quest to restore balance and you get to play multiple characters on your journey. It was helpful to have a reminder of what happened in the previous chapter. From the design, mini games and hop's you get lost in the game for hours. Rated 5 out of 5 by mcquigan from It is brilliant I love a story line; we have one here. They also go back and give you a wonderful recap in case you've forgotten what the first game was about. There are not very many hops so far (in the demo); there are plenty of different puzzles though. I don't think you'll be looking for something to pull that pesky zipper up on this game; it is much smarter than that. People have been clamoring for "something different"; this is it. It is a beautiful well thought out game that will require you to stop and think on occasion. Rated 5 out of 5 by LogieBaby from A continuing story is good as long as originality is the key element The initial Saga of the Nine Worlds is IMO one of the 5 best games of 2017. The drawing is phenomenal, the characters compelling and best of all the story is completely original. I would surmise that most people are seriously unfamiliar with Norse mythology so to provide us with this folk tale is brand spanking new to an overwhelming majority of HOPA fanatics. 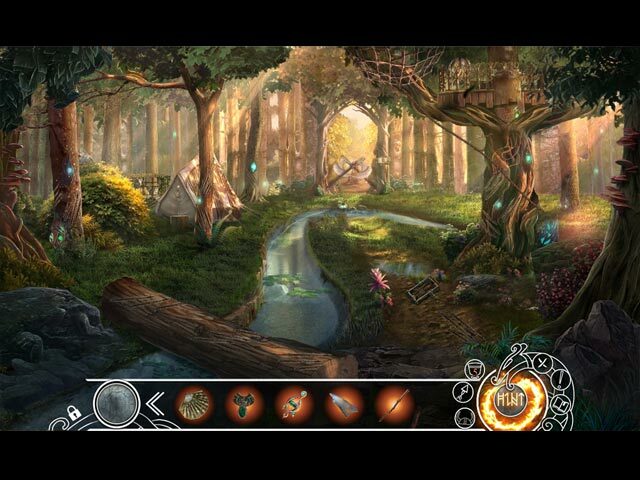 In continuing the story with Four Stags Eipix furthers the saga in a most enlightening manner. I am sure there is significant " poetic license " involved. I for one do not care because the story holds my interest from start to finish. Combine this with a strong game and I am in HOPA heaven. Another review laments this aspect yet we have seen it oh so many times, some more successful than others. Lots of gamers were thrilled having 5 Ravenhearst games with each succeeding installment delineating the Dalimar intrigue. We have had many more games about the Gray family ghosts , vampires and werewolves. There must be at least 8-10 games including the devilish imp St. Germain and lots of mysteries featuring the great detective Monsieur Dupin. As long as the story remains strong the more the merrier. I am pleased to see the return of the Seer, Huntress and Skald not only because this Scandinavian epic continues but because the game itself holds my interest. My take is the game is not for beginners as there is significant challenge as the player progresses. The fact that we get to instill ourselves into each primary character is fun. After being reintroduced to the 3 primary assistants the player gets a long chapter as the Huntress and her work is not done as the demo ends. How many of us are bored to death with games constantly featuring a mother protagonist who has her child abducted into an otherworldly realm and must defeat a sinister enemy by being helped by a ferret, or a mouse or some sort of bird. As long as Saga entries keep player interest foremost I say KEEP THEM COMING !! Based merely on the demo my guess this is another fantastic Eipix effort. Rated 5 out of 5 by rainworm from ....and our adventure continues! It is the 2nd installment of the epic tale, where we were introduced to the world of Nordic gods and fight with humans and other creatures. In the Gathering we played as a Shield Maiden and met our companions: the Skald, the Seer and the Huntress. With the four stags, the four of us will continue our adventure. The balance between the nine worlds is threatened as the four stags are missing. The world tree Yggdrasil is not only the base for the nine worlds but also home of the four stags (Dvalinn, Duraþrór, Duneyrr, and Dáinn), who are grooming it. So our task will be to restore order and bring them back. It seems, Odin himself calls on us at the beginning óf the game and we prepare for the battle, one by one seeking our weapons for the battle. In HOS the seer, the huntress and the skald are equipped to fight a fire spitting beast. Then we are ready to seek the four stags and bring them back to Yggdrasil, so that they groom the holy tree again. Our first station will be at the Elves realm (Alfheim). It is under attack of the Dwarves. We can help an Elf, who is threatened by a robot. When we enter the Elves’ world, we are not welcome at first and have to overcome obstacles on the way to the fair lady Freya, their queen, who got tired of Asgard, where she stayed before and came back to seek rest and peace. 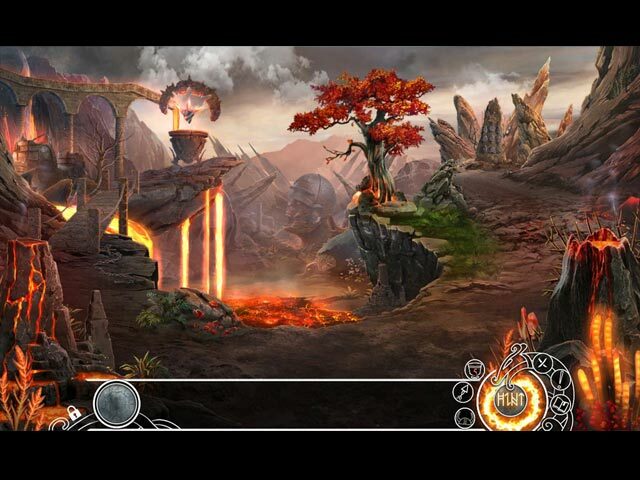 In Alfheim we will find one of the missing stags but it will be a long way till we may fulfill our task. From the very beginning of this game, we enter a strange new game world, where nearly every step is a mini game or a puzzle and many variable HOS give a helpful hand. With Elves and Dwarves we leave the realm of humans and enter other homeworlds of the Norse mythology. There is no fast unfolding of a plot but more an overcoming of impediments on the way to find and bring back the stags. The mythological background is well shown. Our first station, Alfheim, is the world of the Light Elves, minor gods of nature and fertility. Their knowledge of magic may help or hinder humans. We should finally find help here and go on into other worlds.